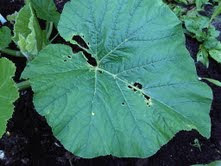 Well, my Paton Twins Giant Pumpkin is enjoying this spell of warm, sunny weather. The leaves are enormous! It has certainly inherited some special genetics. The hot weather over the past few days has stimulated the production of female flowers on the plant. With any luck this may be the beginnings of a pumpkin of sorts... but the weather so far this Summer hasn't given it the best start it might have had. Speaking of giants.. do you remember my Bulgarian Giant leeks from a couple of years ago? Like many giant veggies it was spectacular to look at, fun to grow but tasted of nothing at all really. Well, here's another Bulgarian Giant I spotted at the Olympic Volleyball match at Earls Court this morning! All my tomatoes were stubbornly green until Summer officially started in London yesterday! Sunshine and warmth is now with us, and today saw the hottest day of the year so far at 30C. As a result of the bright light my Sungold tomatoes have started to ripen! My first pickings of Dog Beans were absolutely delicious! This unusual variety was given to me by a fellow blogger a few years ago. I am most definitely going to keep some of these seeds to keep this variety going. 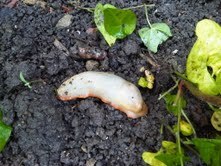 Let's hope this hot, dry weather keeps those pesky slugs away from them! And my first picking of this lovely little Cucumber Delicata were gorgeous! This variey of cucumber is more closely related to the melon, it has a stunning crisp, watery texture and a superb flavour! I also love the size because one cucumer equals one meal! No need for half cucumbers hanging around the fridge for days! We are also looking after Chicken Bhuna, Chicken Balti and Chicken Bhaji for a couple of weeks while my Sister goes on holiday. I'm pretty sure that in their short lives so far they have never come across a large, barking yellow Labrador at close proximity! Leo has been running around their pen barking at them! I think he will find out pretty soon that they are armed with sharp beaks! Stand by. And finally, I am going to be asking for photo contributions to another Matron's Trugblog! in the next few days. Arrange some of your fruit or veggies in a basket or trug and email it to me. I'll let you know the dates in the next couple of days. Get digging! It has not been the easiest of growing seasons on Matron's allotment. I am pretty sure that this yellow blotching on my tomato leaves inside the greenhouse is a Magnesium Deficiency. So a google search shows me what to do. Go to your chemist and look like you are suffering from constipation, and ask for Epsom Salts (Magnesium Sulphate). I then made a weak solution up in a watering can and drenched the tomato leaves in this solution. Fingers crossed that they will get relief!! Awaits results. Another tricky tomato problem I'm having this year is Tomato Leaf Curl. So a google search informed me that the most likely cause is 'wet and cool conditions'.. surely not!!!! Elsewhere on the patio, I have a few more very tiny Sungold tomatoes! My favourite! None ripe yet in the greenhouse, I just feel that they are all just waiting for sunshine! Fingers crossed we are going to have a brighter weekend, it might just start the ripening process! This was a self seeded Elephant Garlic clove that I forgot to dig up last Summer. I let it grow in situ all Winter and Spring. At times I wondered if it was a leek but a sniff of the leaves told me otherwise. Now that the leaves are starting to die back I decided to dig it up and have a look to see what's underneath. So exciting, it's like digging for buried treasure. Ta Daaah! what a whopper! Interesting little baby cloves growing on the roots. I think I will pot these up and try to grow them on. I did get a few ideas on how to eat them when I visited the Garlic Farm stand at the Hampton Court festival recently. I think I will roast the whole bulb slowly in the oven. Sounds delicious! Gooseberries are just so misunderstood in my mind. If the only experience you have ever had of gooseberries are those horrid little sour bullets that they sell in supermarkets then I suppose I wouldn't like them either. But the real McCoy is JUST SO DIFFERENT. I thinned out the smaller fruit so that just a few of the best gooseberries will ripen and sweeten. You just cannot imagine how sweet and flavoursome a ripe gooseberry is until you have had one. Best eaten straight from the plant without telling anyone, or there will be none left! These light green fruit are Invicta. A really healthy variety. Slightly later afterwards come these Hinnomaki Red gooseberries. Just a couple more weeks to go before these are ripe. I noticed this moth hanging on for dear life under the leaves! I don't think he is doing any harm. So what did I do with the thinnings? Gooseberry crumble of course! Heavenly! Matron does not do flowers! I must make this perfectly clear. However when these beautiful pink passionfruit flowers develop into tasty 'banana passionfruit' then I can clearly make an exception in this case. I took these photos on holiday in Madeira where this passionfruit vine grows wild everywhere. In fact it is quite a pest and grows up trees and just doesn't stop. After the pendulous pink flowers come the elongated passionfruit. You can see them here for sale in the market in Funchal, the green fruit at the top right of the photo are absolutely delicious. So when I was at Hampton Court Show last week I bought a Passiflora Mollisima passion fruit vine. Already since purchase the growing tip has put on a full 5 inches!! It likes it hot and dry.. so perhaps I shall emigrate to a country where it doesn't rain all day every day. It is not hardy so it will stay in a pot and climb up some South facing brickwork where it has the best hope of a happy life. I don't think the season here in the UK is long enough to produce flowers and fruit, but I'll give it a good try! 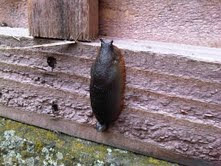 All this wet weather has been perfect for slugs and snails. Just so annoying when they take great big mouthfulls out of your prize veggies. 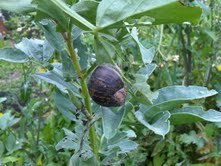 The snails have taken a habit of climbing up into my broad beans to help themselves. I have never seen broad beans attacked so much as they are this year. 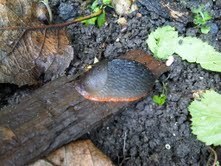 Grey slugs with orange bottoms! 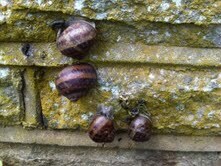 Not forgetting the snails! I think it is time for war to begin!